http://powellrivermortgagebroker.com/wp-login.php?redirect_to=https://powellrivermortgagebroker.com/home/ http://apexlimo.com/cms/ Audie Leon Murphy was born on June 20, 1925 in Kingston, Texas. He was the seventh of twelve children in a family abandoned by their father during his childhood. Murphy left school after the fifth grade and was orphaned with the death of his mother in 1941. 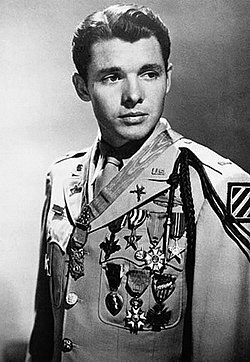 Murphy spent his entire combat career with Company B, 1st Battalion, 15th Infantry Regiment, 3rd Infantry Division. He participated in the Sicilian, Italian, and southern France campaigns and on into Germany. Murphy rose through the ranks from Private to Staff Sergeant, and then received a battlefield commission as a Second Lieutenant, ending the war as a First Lieutenant. 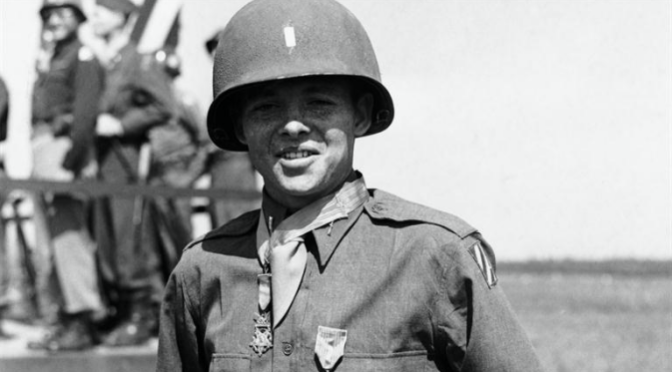 He was awarded every decoration for valor the United States could give him: two Bronze Stars with Combat “V”, the Legion of Merit, two Silver Stars, the Distinguished Service Cross, and the Medal of Honor. On January 26, 1945 near Holtzwihr, France while Murphy was commanding Company B, he personally held off and disrupted a Nazi counter attack, holding his position atop a burning vehicle that could have exploded at any moment. When he ran out of ammunition, despite being wounded, he rejoined and rallied his company and led them forward once again. Citation: 2d Lt. Murphy commanded Company B, which was attacked by 6 tanks and waves of infantry. 2d Lt. Murphy ordered his men to withdraw to prepared positions in a woods, while he remained forward at his command post and continued to give fire directions to the artillery by telephone. Behind him, to his right, 1 of our tank destroyers received a direct hit and began to burn. Its crew withdrew to the woods. 2d Lt. Murphy continued to direct artillery fire which killed large numbers of the advancing enemy infantry. With the enemy tanks abreast of his position, 2d Lt. Murphy climbed on the burning tank destroyer, which was in danger of blowing up at any moment, and employed its .50 caliber machinegun against the enemy. He was alone and exposed to German fire from 3 sides, but his deadly fire killed dozens of Germans and caused their infantry attack to waver. The enemy tanks, losing infantry support, began to fall back. For an hour the Germans tried every available weapon to eliminate 2d Lt. Murphy, but he continued to hold his position and wiped out a squad which was trying to creep up unnoticed on his right flank. Germans reached as close as 10 yards, only to be mowed down by his fire. He received a leg wound, but ignored it and continued the single-handed fight until his ammunition was exhausted. He then made his way to his company, refused medical attention, and organized the company in a counterattack which forced the Germans to withdraw. His directing of artillery fire wiped out many of the enemy; he killed or wounded about 50. 2d Lt. Murphy’s indomitable courage and his refusal to give an inch of ground saved his company from possible encirclement and destruction, and enabled it to hold the woods which had been the enemy’s objective. The President of the United States of America, authorized by Act of Congress, July 9, 1918, takes pleasure in presenting the Distinguished Service Cross to Staff Sergeant Audie Leon Murphy (ASN: 0-1692509), United States Army, for extraordinary heroism in connection with military operations against an armed enemy while serving with Company B, 15th Infantry Regiment, 3d Infantry Division, in action against enemy forces on 15 August 1944, in the vicinity of Ramatuelle, France. Staff Sergeant Murphy landed near Ramatuelle, France, with the first wave of the assault infantry, at 0800 hours, 15 August 1944, until halted by intense machine gun and small arms fire from a boulder-covered hill to his front. Leaving his men in a covered position, he dashed forty yards through withering fire to a draw. Using this defiladed route, he went back toward the beaches, found a light machine gun squad and, returning up the rocky hill, placed the machine gun in position seventy-five yards in advance of his platoon. In the duel which ensued, Lieutenant Murphy silenced the enemy weapon, killed two of the crew and wounded a third. As he proceeded further up the draw, two Germans advanced toward him. Quickly destroying both of them, he dashed up the draw alone toward the enemy strongpoint, disregarding bullets which glanced off the rocks around him and hand grenades which exploded fifteen yards away. Closing in, he wounded two Germans with carbine fire, killed two more in a fierce, brief fire-fight, and forced the remaining five to surrender. His extraordinary heroism resulted in the capture of a fiercely contested enemy-held hill and the annihilation or capture of the entire enemy garrison. Staff Sergeant Murphy’s intrepid actions, personal bravery and zealous devotion to duty exemplify the highest traditions of the military forces of the United States and reflect great credit upon himself, the 3d Infantry Division, and the United States Army. The President of the United States of America, authorized by Act of Congress, July 9, 1918, takes pleasure in presenting the Silver Star to First Lieutenant (Infantry), [then Staff Sergeant] Audie Leon Murphy (ASN: 0-1692509), United States Army, for gallantry in action against the enemy while serving with Company B, 15th Infantry Regiment, 3d Infantry Division. On the morning of 2 October 1944, near Cleurie Quarry, France, First Lieutenant Murphy inched his way over rugged, uneven terrain, toward an enemy machine gun which had surprised a group of officers on reconnaissance. Getting to within fifteen yards of the German gun, First Lieutenant Murphy stood up and, disregarding a burst of enemy fire delivered at such close range and which miraculously missed him, flung two hand grenades into the machine gun position, killing four Germans, wounding three more and destroying the position. The President of the United States of America, authorized by Act of Congress, July 9, 1918, takes pleasure in presenting a Bronze Oak Leaf Cluster in lieu of a Second Award of the Silver Star to First Lieutenant (Infantry), [then Staff Sergeant] Audie Leon Murphy (ASN: 0-1692509), United States Army, for gallantry in action against the enemy while serving with Company B, 15th Infantry Regiment, 3d Infantry Division. On the afternoon of 5 October 1944 near Le Tholy, France, First Lieutenant Murphy, carrying an SCR 536 radio, crawled fifty yards under severe enemy machine gun and rifle fire, to a point 200 yards from strongly entrenched enemy who had prevented further advance. Despite machine gun and rifle bullets that hit as close as a foot to him, First Lieutenant Murphy directed artillery fire upon enemy positions for an hour, killing fifteen Germans and inflicting approximately thirty-five additional casualties. His courage, audacity and accuracy enabled his company to advance and attain its objective. The President of the United States of America, authorized by Act of Congress, 20 July 1942, takes pleasure in presenting the Legion of Merit to First Lieutenant (Infantry), [then Staff Sergeant] Audie Leon Murphy (ASN: 0-1692509), United States Army, for exceptionally meritorious conduct in the performance of outstanding services in Italy and France, as Platoon Sergeant, Platoon Leader and Company Commander of Company B, 15th Infantry, 3rd Infantry Division, from 22 January 1944 to 18 February 1945. First Lieutenant Murphy has always carried out his missions, no matter how hazardous, with marked ability. He often assumed leadership of his platoon in the absence of sufficient commissioned personnel and so intelligently and courageously led his men that he was commissioned an officer during the French campaign and commanded his company in a superior manner during the obliteration of the Colmar Pocket. First Lieutenant Murphy’s personal bravery, his skill in imparting his own knowledge of enemy tactics to his men, and his voluntary assumption of hazardous patrols and missions have benefited his unit to an immeasurable degree. Murphy left the active Army in 1946 and later served in both the Texas National Guard and United States Army Reserve, retiring as a Major in 1966. He recounted his wartime experiences in his memoir To Hell and Back (1949). He was a successful actor with a career that spanned from 1949-1969 and portrayed himself in the movie version of To Hell and Back in 1955, at the time, the largest hit Universal Studios had ever produced. Tragically, Murphy was killed in the crash of a light aircraft at just age 45 on May 28, 1971. He was laid to rest in Arlington National Cemetery. 1st Battalion, 15th Infantry is presently a combined-arms battalion as part of the 3rd Armored Brigade Combat Team of the 3rd Infantry Division and is based at Fort Benning, Georgia. Previous PostMaster Sergeant Nicholas Oresko, USA (January 23, 1945)Next Post#TFH Live 1/26: #RightToLife & More!